Following the success of First Friday, one of Manchester City Centre’s most enjoyable and successful networking events, Forever Manchester, in partnership with Myerson Solicitors is pleased to bring you Forever Friday: Altrincham. Hosted at The Old Market Tavern on Old Market Place in Altrincham, Forever Fridays is a free networking event that allows like-minded people to meet in a relaxed networking environment and mingle over a few drinks. 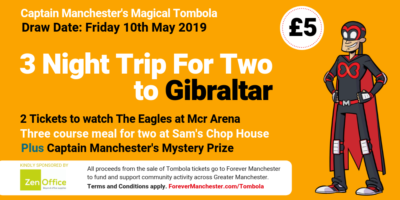 Forever Manchester staff will be on hand to make introductions and share upcoming activities for you to get involved in to raise money to support community projects across Greater Manchester. Guaranteed: No speeches – No Fundraising – No Networking techniques required! Forever Friday is free to attend, but please register to book your place as they are limited. Friends and colleagues are also welcome but please sign them up too, as places are limited and we want to ensure we have the correct space in the room at the Old Market Tavern. We’re looking forward to taking our award nominated networking event on the road and meeting likeminded businesses in the Altrincham area. If you’d like to book your place, please use the ticketing form below to sign up for free.